So, it’s Valentine’s Day today and Scotty is away from Sydney doing something excellent at the Adelaide Fringe Festival. But, don’t be sad for me as: 1. We don’t really celebrate Valentine’s Day; and 2. It means I can cook with all the ingredients that he isn’t very fond of (like Cherries) while he is away. This is one of those “I-know-I’m-eating-something-sweet-but-it-looks-savory-so-it-messes-with-my-head” dishes. They are always fun. This idea was born through wanting to make something for Valentine’s Day that was a little less “love-hearty” than last year’s Secret Love Cupcakes but no less surprising (FYI I know am walking the fine line of too many parenthesis in this post already and I promise to stop using them – also, I’m not even sure if I’m using them correctly). It is rare that a dish this unusual will appear in my mind so clearly with all elements concocted, so I figured I better trust the old noggin and give it a try. Yesterday, I had intended to get home from work at 6pm, shop for the ingredients, make and rest pasta and filling, cook the dish, photograph it, edit the photos and write the post all in one night. It was a fool’s errand and I clearly wasn’t thinking straight when I attempted to achieve it all. Miraculously, I got almost to the end with just the post left to write at 11pm. Then I realised that I was an idiot and the extra step would likely kill me. So, I made the executive decision (because I can) that this post is going up on Valentine’s Day instead of before it. But I’m sure you can all live with that. The absolute key to this dish is the fresh cherries. You see, I didn’t want these ravioli to be sickly sweet. I wanted the slight tartness of cherries to shine through. I chose to include hazelnut meal with the pasta flour instead of adding just sugar as I wanted to taste the nuttiness in the dough. You will definitely be seeing this pasta again soon – most likely in a savoury dish. I couldn’t help but think the Walnut pasta would work brilliantly for both sweet and savoury (I’m thinking something with mushrooms and cream). This recipe was so fun to make and the end result is wonderful, but it does have a few steps. I would probably suggest the pasta is one to try once you have tried your hand at making normal pasta first. The key is to know what the dough should feel like as you are kneading it to know if you have to add more flour to the mix. Even if you don’t buy into the whole Valentine’s Day concept, it is always fun to make sweets for your sweet. In a bowl mix pasta flour, hazelnut meal and icing sugar till well combined. Place dry ingredients on a clean bench and make a well in the centre. Crack both eggs into the well and beat the eggs a little with a fork. Use the tips of your fingers to mix the eggs with the flour, incorporating a little at a time, until everything is combined. In a medium saucepan combine cherries, lemon juice, water and sugar. Heat over high heat until the mixture boils, then reduce heat to low and simmer for 8 minutes. Remove from heat and strain liquid from the cherries. In a separate bowl, place cherries and blend with a hand mixture. Strain the liquid again and you are left with the cherry sauce. Place the cherry sauce in the fridge until completely cooled (the liquid can be used at a later date to make cherry popsicles). Once the cherry sauce has cooled, combine the ricotta and 4 tablespoons of the cherry sauce. Flour your bench well. Remove dough from fridge and cut a lump of the dough about the size of a small orange. Flatten it out with the palm of your hand. Set your pasta machine at the widest setting and roll the lump through. Then set the machine down a level and roll the dough through again. Continue this process going down a level each time until you get it as thin as you can without the hazelnut meal tearing the pasta (I was able to work it through the machine from setting 1 (the widest setting) to setting 6 (my machine goes to setting 8). Repeat with all of the dough until you are left with fresh lasagna sheets. You are now ready to make the ravioli. Taking one long lasagna sheet, lay it on the floured bench and brush the side facing up with water, then place teaspoon sized portions of the filling 3 cm apart. Take another lasagna sheet the same size and lay it over the first sheet working from one end to the other pushing the sheets together and working around the filling as you go ensuring there are no air bubbles. Once the filling is covered and the pasta sheets firmly together it is time to cut them into ravioli. You can either use a ravioli cutter or a small chef’s ring about the same size. Repeat this step of filling and cutting the ravioli till you have used all of the pasta. Make sure you flour all your surfaces well and also make sure you don’t lay the finished ravioli on top of each other or they will stick together. Bring a medium pot of water to the boil then gently drop in the ravioli a few at a time till the pasta is cooked (about 3 minutes each). Repeat with remaining ravioli. 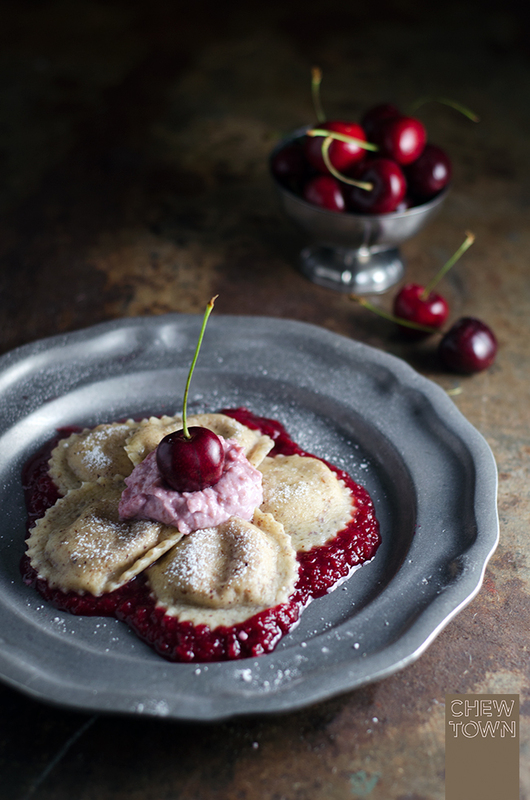 Place a few tablespoons of the cherry sauce onto each place and top with the cooked ravioli. Add a dollop of the remaining filling on top then add a cherry. Serve and eat immediately. Gorgeous as always – and what a great flavour combo! Love the bit of trickery ;D Happy Valentine’s Day! This is genius! I’ve been pondering (almost said noodling, but you know!) ideas of using pasta for dessert, but this is better than anything I’ve imagined (although I have a couple that are close). Love the hazelnut pasta! And yes, I think using this dough in a savory dish would be excellent. Really, really like this. You’ve achieved the magical 11!. This hazelnut ravioli looks like red hot passion on a plate! You got me LOL because whenever Mysaucepan is away or vice versa we cook the stuff the other person dislikes too!! I absolutely adore sweet dumpling fillings – strawberry pasta with farm cheese, blueberry dumplings – they are all Polish summer dinner staples. I’ve never tried making cherry dumplings myself and the addition of hazelnut meal is most delightful! am loving the sound of that hazelnut pasta. it sounds incredible! and this dish looks even more amazing! Absolutely beautiful and such great flavours. Love a dessert that will mess with your head. I am so glad you stopped by my blog! I cannot believe I have not been by yours regularly! You really have been making some amazing food! So glad I came round the site here and caught this one. Don’t know why it didn’t show up in my feed like your other posts? This looks amazing. And like you said about the pasta, I need to make more to get to know the feel of the dough. BUT, this will definitely be one I try and will let you know how it turns out. The sweet and tart aspect and the image make my mind do a double take, but I need to know how this tastes! Again Amanda, beautiful photography. Does it an italian recipe? Because i hear ofter for Ricotta over here.